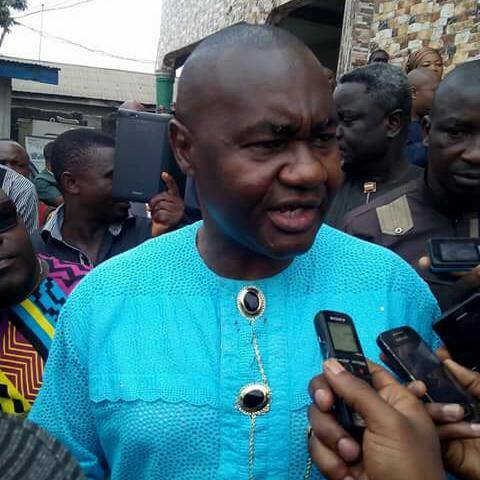 Senator Magnus Ngei Abe, the All Progressives Congress (APC) candidate in the Rivers South East Senatorial District re-run election has expressed fear that his life could be in danger because of the level of conspiracy against him by Governor Nyesom Wike. Speaking at Silverbird Rhythm fm 93.7 news and current affairs programme tagged: “The ViewPoint”, in Port Harcourt, Abe said that there had been a meeting of militants in Ogoni sponsored and masterminded by Governor Nyesom Wike against him. “There is an evil in Rivers State and I have chosen to speak against it. If anything happens to me, Nigerians, Rivers, Ogoni people and my family should hold Governor Nyesom Wike and his PDP people responsible because the threat against my life is too much”. Abe said that he fears a situation where he could be attacked and the Rivers State Government led by Wike would paint a picture that his people killed him because of the Yeghe crisis. He noted that the Ogoni people love him and would not do such except outsiders or those who could be sponsored by the state government. He said that the governor and PDP were seeing him as a strong voice from APC that must be silenced at all cost. The former Secretary to the State Government narrated how the governor at Luuwa in Khana Local Government Area during the 50th birthday of Senator Lee Maeba had charged his supporters to stop him by all means, pointing out that he specifically said to stop and not to vote against him. He further said the ripples of the threat were beginning to manifest with the Yeghe crisis, attempt to malign his reputation and now a meeting of the militants.